Howdy all. I'm working on removing the head from my 258, but am having some difficulty getting the exhaust manifold out of the way. It's technically disconnected from the head, but I can't get it separated from the exhaust downpipe to remove it from the engine bay. I see there's 3 bolts between the manifold and the pipe. There's one big horizontal bolt head on the front of the pipe, and two smaller vertical bolts that clamp the pipe and manifold together. I cant see a way to get the 2 vertical bolts out without removing a bunch of stuff from under the engine. I assume they need to come out, some how? Is there an easier way? What's the story with the big horizontal bolt? Does it need to come out at all? I've tried turning it and hit it with more penetrating oil that I care to admit, yet it hasn't budged. Instead the corners of the bolt are starting to get rounded off from the struggle. In a lot of photos I've seen, it looks like people just cut the downpipe in half. I've been tempted to do the same, but once that's done, there's no going back. Why are so many people cutting the pipe? I've attached some photos to make it clear what I'm talking about. Horizontal bolt = green, vertical bolts = yellow. I think what you have circled in red in the 2nd picture shouldn't matter. The flange with two bolts should be all that is holding the downpipe to the manifold. If you're not *too* worried about saving the downpipe since it looks pretty rough already, break the bolts loose using a long extension if you have to. They look like they may shear off as it is though. Once the bolts are broken loose (or just broken) a good whack with a hammer should result in two separate pieces. 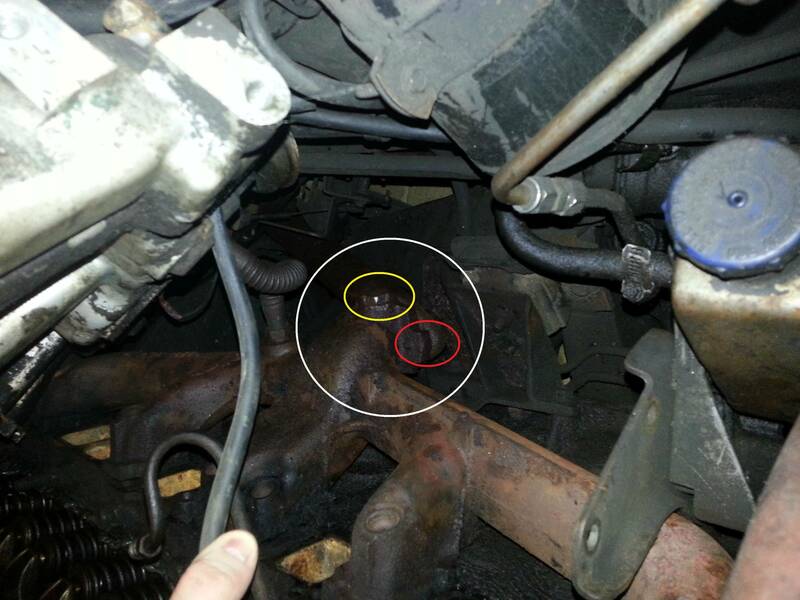 Pretty sure what you have circled in red is/was for EGR valve. It's just a plug on yours. Don't worry about removing it. I took these off not long ago and they can be a challenge, and rusty! Thanks guys! The plan is actually to do 4.0 head swap, so I'll probably junk the manifold and downpipe, anyway. I think a sawz-all might be my best bet. Before I commit to that, did you get to he 2 bolts from under the car? The axle is under them, so I dont see a good way to do that without a mess of extentions and swivels. I tried from above, but didn't have any luck. Maybe putting some plywood over the passenger half of the engine to lay on might make it easier? I've been able to reach the front one from above, but not the back one. I think it required one swivel, maybe a short extension. For the exhaust nuts I went to autozone and bought a three eights drive socket that had a hex head end on it. After soaking the nuts with pb blaster I put the socket on the exhaust nuts and used a box end wrench on the socket. Worked really well. Installed the new pipe and nuts the same way. Gotta tell ya it sure beat using all these extentions and swivel joints. After soaking in penetrating oil and finding a combination of a six point thin walled socket and swivel and extensions, I have found that rusty exhaust manifold bolts tend to come off with a fight to the last turn! I have always accessed them from under the car. I found it best to try to tighten the nut at first to break it free, then back it off a bit, then tighten it back the same amount, then back it out some more, repeating the process until the nut is backed all the way out. On rusted out down pipes that look like they'll need replacement anyway, I prefer the Sawzall to all that wrenchin. If you're planning to swap in a 4.o head, you will have trouble getting the stock manifolds to line up on the 4.o head's ports(it can be done, though), and might consider using a 4.o exhaust "header" manifold instead of the stock one, but the 4.o header will be a tough fit with the front axle, unless you modify the front axle's pinion mounting bracket or modify the header. I chose to modify the header, and used a late 80's Renix log-style header, cut off the flange, cut out the section with the EGR tube port, and welded the flange back on angled back to allow the downpipe to clear the front axle's pinion bracket with some creative tubing bending. I have yet to build the downpipe to finish the installation. I swapped in MPI injection, and haven't finished the project, life(other projects and BS) got in the way. Thanks guys, but it looks like I'm gonna have to break out the sawzall tomorrow I was able to get the nuts easy enough with a swivel, but ended up snapping both of them. I spend more time than I'd like to admin trying to drill them out. Screw it, the exhaust is rusted to heck anyway, and I need an excuse to practice my welding and pipe bendnig. Custom exhaust, here we come! 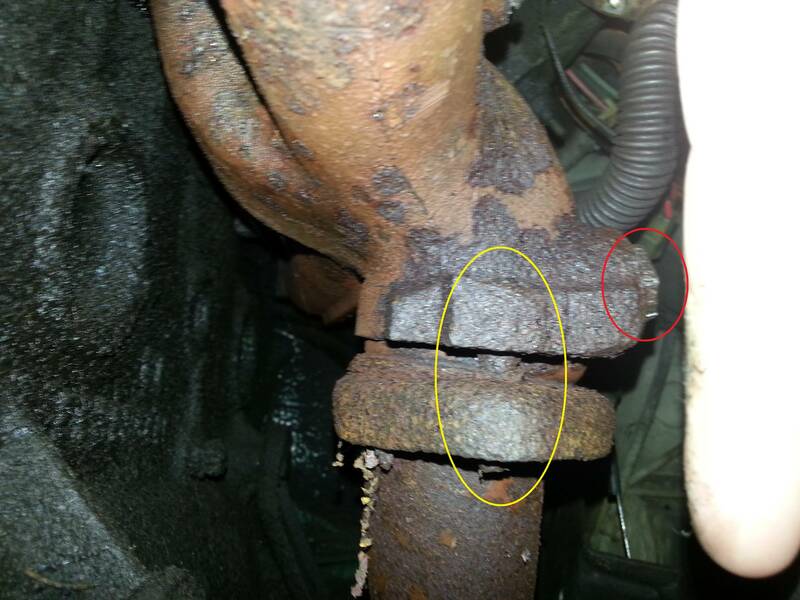 Next question: In the first picture i posted, on the bottom right corner there is a really annoying bracket that prevents the exhaust manifold from being removed from a post. It has to go before I can get the manifold out. It appears to be held on by 4 bolts. As with pretty much everything else on this car, it's pretty well rusted. I've already rounded off one of the bolt heads while trying to get it off. Any tips? Whats this bracket for? Can I just take a cut-off to it? Sawzall will solve the issue no problem, I had to do the same. The bracket that you speak of, looks to be the power steering bracket that bolts to the intake, I would not lob that off, it keeps the pump from flexing. Though, if it's the air injection pump bracket, Which would've been in the same general area, **** it, cut it off. That big one is a plug for an oxygen sensor, I believe. I have accessed them from underneath. The A-Arm has a hole in it for accessing the front nut with a long extension. The rear is just accessed around the down pipe. They rust good and solid, that's for sure. Running a die down the remaining thread and then heating the snot out of it with an acetylene torch works. I usually make a trip down to the parts store for some fresh studs and brass nuts when I'm done. It makes the next time I decide to tear into the engine much easier. You'll need that bracket to reattach the power steering pump unless you get the correct 4.0 one... then you'll need the holes it's attached to. Heat, and hit the bolt square with a hammer and punch if you can. You may need a specialty socket to grab it rounded off. 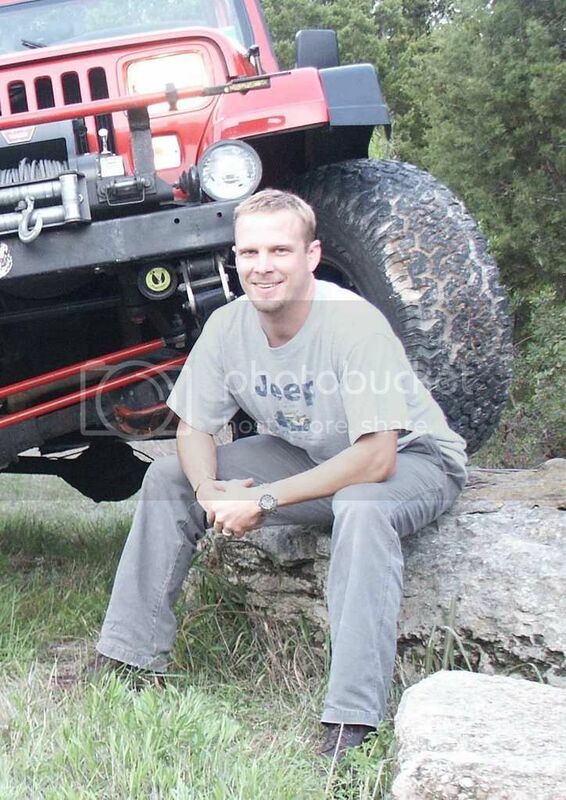 that bracket is for power steering and i have had no trouble removing mine. spray a bunch of pb/wd40/whatever you use on it if it's rusty and wait a bit. u-joints and swivel sockets are your best friend in this car. if i remember right they are a 9/16 and there are multiple other bolts on the motor that you'll be able to use that swivel on (intake/exhaust/etc) so it's money well spent. I'm not sure if anyone has posted or discovered this, but there is an access hole for the front bolt on the downpipe. I found it today while struggling to remove mine. I tried to take a picture but it's a tough spot. If you stick your head under the front diff and look up between the diff cover and front subframe, there is a hole. It is not perfectly lined up with the bolt, but you can see the flange. A long extension ~10" (14-16 would work better) one swivel on the nut end, and the socket with a breaker bar is all you need. Be sure to get the socket seated properly on the nut to avoid stripping it. The extension will be at ~45 degree angle to the right of the pumpkin (as you're looking toward the front of the car). The front stud actually pulled out on mine which I am actually happy about. I'll probably use a bolt with some never-seize on it for re-installation. I'm going to try to get the other stud out but I'm not sure how well that's going to work.